The rate of new home sales increased 6.4% in April from an upwardly revised March to 433,000 virtually matching the first quarter average of 434,000 (seasonally adjusted annual rate). The 26,000 monthly increase was entirely due to a 27,000 increase in sales in the Midwest region. However, the monthly and regional data are subject to significant variability so it is not clear that buying conditions were significantly different in the Midwest. The April Midwest 84,000 monthly sales rate was significantly different from the 9-month average of 58,000 but still not within a 90% confidence interval indicating a change. The most positive component of the release was a continued increase in inventory, now up to 192,000 homes for sale from a low of 142,000 in July 2012. 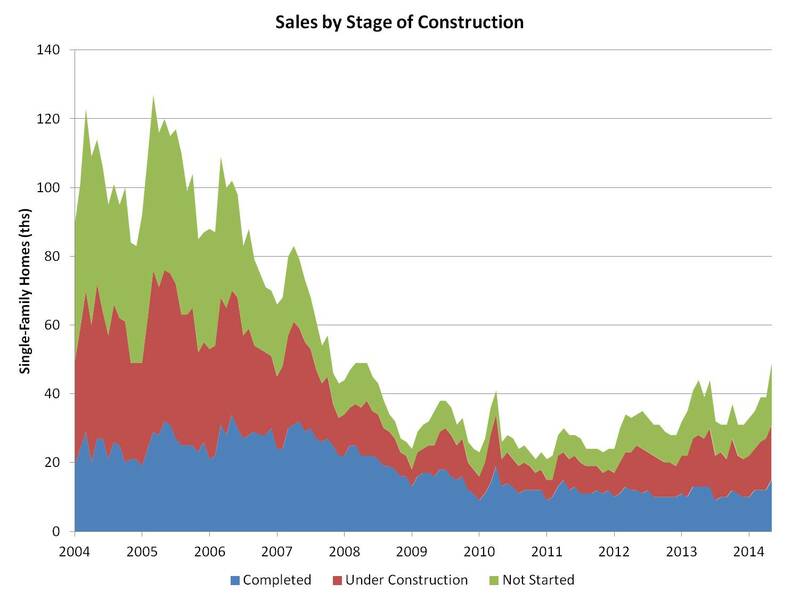 Builders continue to experience supply chain difficulties but the slow increase in inventory indicates some ability to expand construction. More importantly, the increase in supply provides more opportunity for potential home buyers to find the home they want and provides an alternative to the very low supply of existing homes on the market. New home sales prices dropped 1.2% but that is more likely a compositional effect of the large increase in sales in the Midwest; sales of homes over $400,000 declined slightly. New home sales remain at half their normal levels as the economy and potential home buyers continue to readjust to the devastating impacts of the Great Recession and its aftermath. Housing market conditions are in good shape for a strong recovery; mortgage rates remain historically low, affordability while down from extremes remains good by historic standards and a significant amount of pent up demand remain unfulfilled. However, job growth is behind past recessions and income growth especially for young adults is slow or negative. As the economy improves on a more sustainable and consistent basis, housing will also improve more rapidly. The share of new single-family home sales purchased using Federal Housing Administration (FHA) backed mortgages continued to fall at the start of 2014. 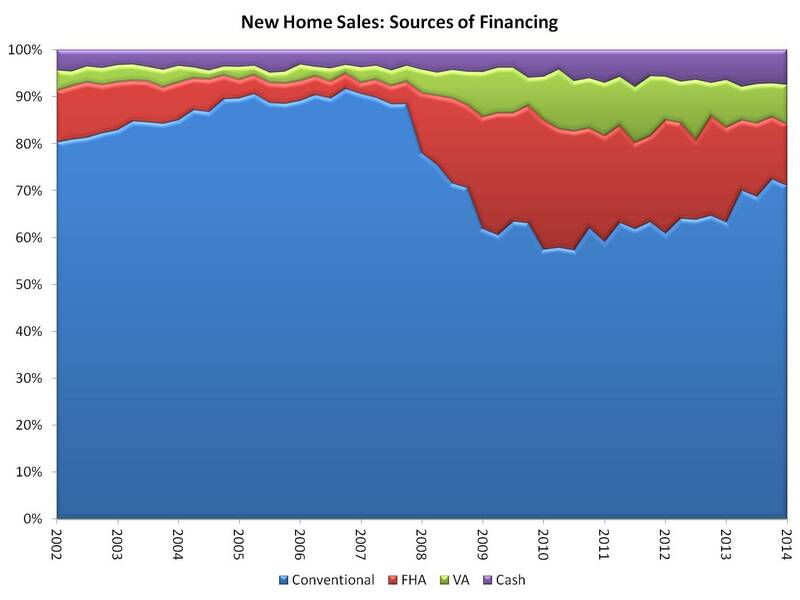 According to data from the Census Bureau’s Quarterly Sales by Price and Financing, the onset of the housing crisis in 2007 led to a decline in the share of new home sales due to conventional mortgage financing and increases in the shares due to mortgages backed by the FHA and the Department of Veteran’s Affairs (VA), as well as cash purchases. For the first quarter of 2014, the share of cash purchases rose slightly to 7.5% from just more than 7% during the prior quarter. The high point for cash purchases occurred in the third quarter of 2011 when the market share was almost 8% of sales. 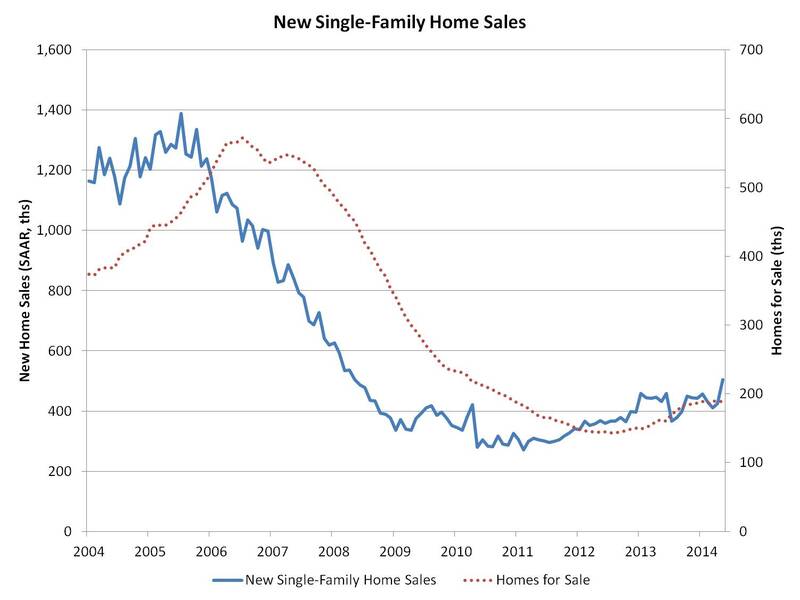 Thus, the cash share of new single-family home sales is down somewhat from post-recession peaks but remains elevated compared to more normal periods (e.g. approximately 4% share during 2002-2003). In contrast, cash purchases constitute a considerably larger share of the existing home market – 33% of sales in March 2014 for example. It is worth noting that another measure of cash sales for total new construction from CoreLogic shows a higher level of cash sales than the Census: 17.7% in December 2013. New home sales due to FHA-backed loans fell to 13% of the market during the first quarter. This is down from 27.6% in the first quarter of 2010 but above the 10% 2002-2003 average. As the conventional mortgage financing share has risen, the share of new single-family home sales due to FHA-backed mortgages has declined. Falling FHA loan limits will likely place additional downward pressure on this share in 2014. VA-backed loans were responsible for about 7.5% of new home sales during the first quarter of 2014. These sources of financing serve distinct market segments, which is revealed in part by the median new home price allocable to each. For the fourth quarter, the median new home price due to FHA financing was $222,600. The median price for VA-backed loans rose to $264,000. Conventional mortgage financing had a median price of $276,900. Finally, the median price for cash purchases for the fourth quarter was $320,100. Census and HUD reported March new home sales were down 14.5% in March to a seasonally-adjusted annual basis of 384,000, the lowest level since July 2013. Three of the four regions also saw a decline while the Northeast saw a small (3,000 homes) increase. The US is down year-over year by 13.3% and all four regions also experienced an annual decline. Home prices, on the other hand, rose 12.6% year-over-year to $290,000, the highest ever recorded. The higher prices are due to sales sliding up the price spectrum. The share of homes sold between $300,000 and $500,000 rose from 30% in the fourth quarter of 2013 to 37% in March. The share selling for less than $200,000 dropped 3 percentage points. Even as mortgage rates soften a bit, potential home buyers with even small dings in their credit background are unable to qualify for a mortgage and so are out of the market. Since they tend to buy more modestly priced homes, that end of the spectrum has seen lower sales and the whole market has lower demand. Congress is working on at least some solutions to the uncertainty in the mortgage market by defining the government’s place in the secondary market. A replacement for Fannie Mae and Freddie Mac is being seriously discussed in both chambers and a markup is scheduled in the Senate this month. While that will not solve all the uncertainties and tightness in the market, it will go a long way to providing a path to a more normal, sustainable conduit for mortgages from originator to investor. The first quarter 2014 has been rocked by unusually cold and wet weather causing a drop in construction and some odd sales patterns. January was better than expected, February was in line with expectations and March was lower than expected. The average is close to what NAHB expected: 434,000 actual versus a forecast of 438,000. Looked at from a quarterly basis, activity is in line with the modest recovery. The trend downward for two months is the worrisome part. Pent up demand, relatively low mortgage rates and still good affordability support confidence that sales will improve as 2014 evolves. The share of new single-family home sales purchased using conventional mortgage financing is rising, as the share of Federal Housing Administration (FHA) backed mortgages fell during 2013. For the fourth quarter of 2013, the share of cash purchases fell slightly to 6% from 7% during the prior quarter. The high point for cash purchases occurred in the third quarter of 2011 when the market share was almost 8% of sales. Thus, the cash share of new single-family home sales is down from post-recession peaks but remains elevated compared to more normal periods (e.g. approximately 4% share during 2002-2003). In contrast, cash purchases constitute a considerably larger share of the existing home market – 32% of sales in December 2013 for example. New home sales due to FHA-backed loans fell to 13% of the market during the final quarter of the year. This is down from 27.6% in the first quarter of 2010 but above the 10% 2002-2003 average. As the conventional mortgage financing share has risen, the share of new single-family home sales due to FHA-backed mortgages has declined. Falling FHA loan limits will likely place additional downward pressure on this share in 2014. VA-backed loans were responsible for 7% of new home sales during the fourth quarter of 2013. These sources of financing serve distinct market segments, which is revealed in part by the median new home price allocable to each. 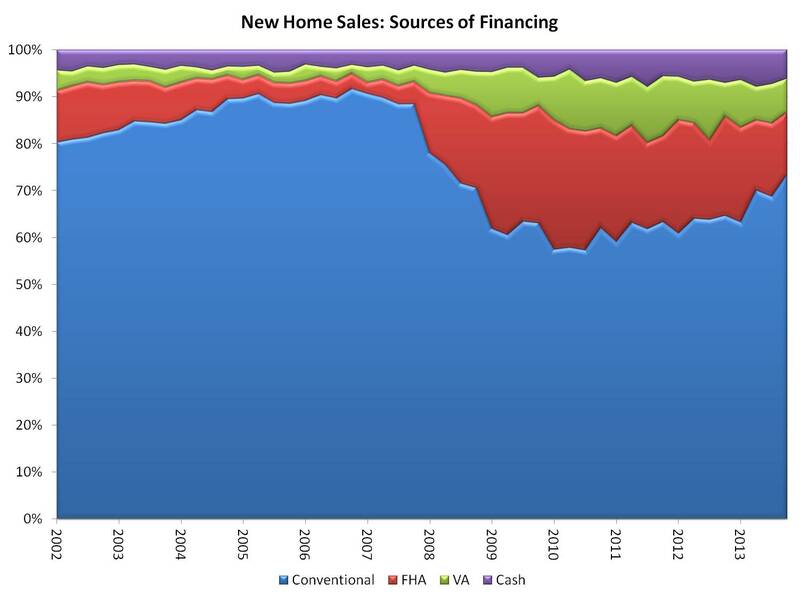 For the fourth quarter, the median new home price due to FHA financing was $212,400. The median price for VA-backed loans was similar: $205,100. Conventional mortgage financing had a median price of $276,600. Finally, the median price for cash purchases for the fourth quarter was $261,000. Census and HUD reported new home sales for December were down7% to an annual rate of 414,000. The first estimate of 2013 annual sales rate shows sales advancing 16.4% and the highest since 2008. 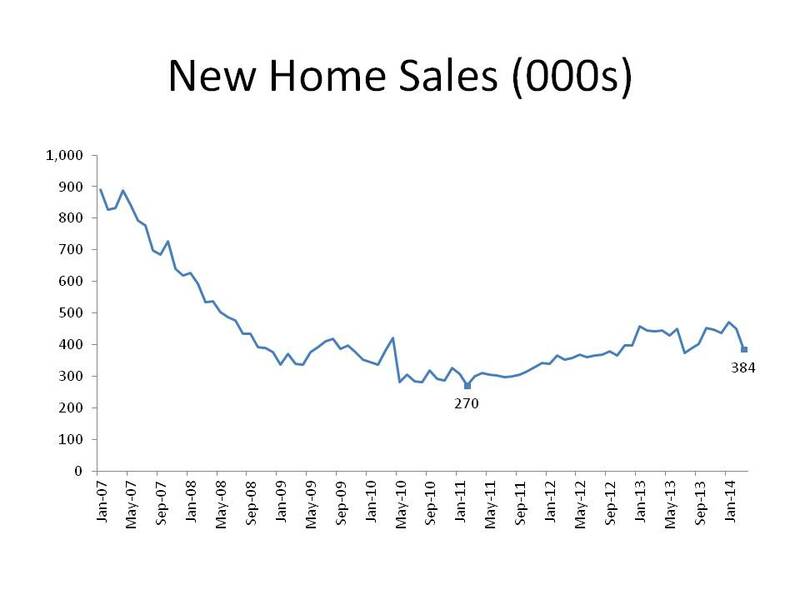 In addition, the fourth quarter new homes sales were virtually the same as the second quarter of 2013. 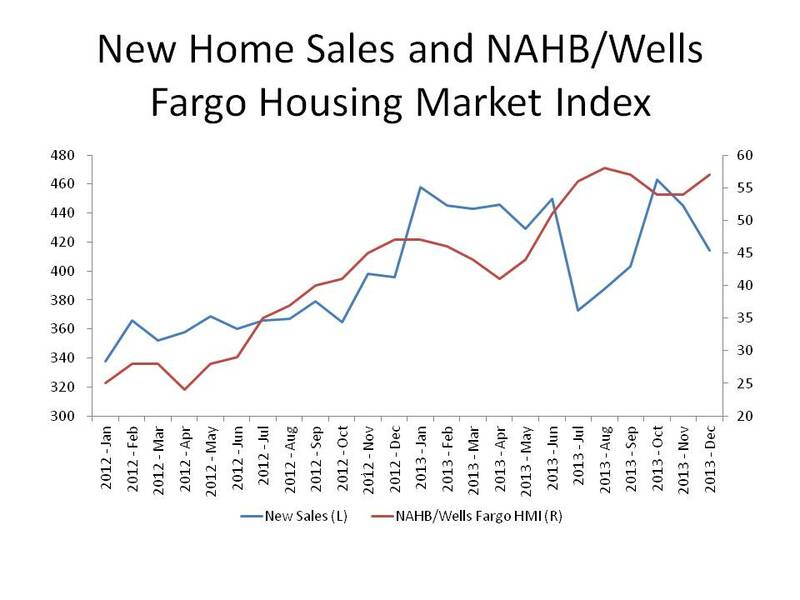 The NAHB/Wells Fargo Housing Market Index showed a similar anticipatory pattern of falling in the spring followed by a decline in sales in the summer. Likewise, the HMI faltered a bit in the fall followed by sales falling slightly from third to fourth quarter. Regionally, the Northeast declined 36.4%, which may have been a result of brutally cold and snowy weather. The South and West also declined 7.3% and 8.8% respectfully, both to levels seen in the second quarter. The Midwest rose 17.6% on a monthly basis but November was unusually low. Inventory fell to 171,000 or down 2.8% but because of the slower sales pace, the month’s supply increased to 5 months. The number of completed homes for sale remains near historic low levels at 40,000 compared to a more normal level of over 100,000. Median sales prices rose 4.6% with no particular shift in the distribution of sales price. The momentary dip is more likely a residual effect of the jump in interest rates, unusual weather and a readjustment to more sustainable level of sales. 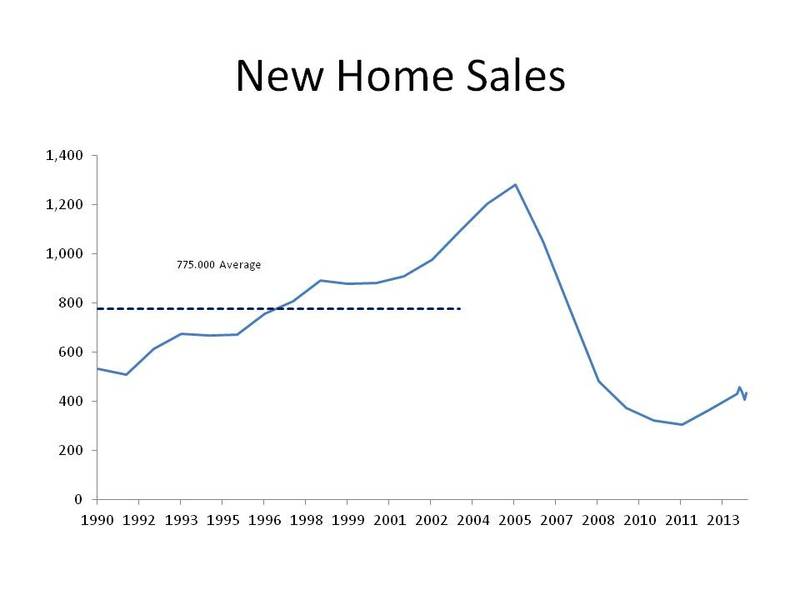 NAHB expects new home sales in 2014 to pick up again and reach 600,000 for the year.